The scene shifts from the Sub-Continent ! Hottest in Asia: Makkah (S.Arabia): 48c. Hottest in India: Wardha (Maharashtra) 47.4c. Nagpur:46.2c,Satna:46c. Hottest Nights: New Delhi(Palam): 34.0c,Chandrapur:34.0c,Kota:33.8c, Hissar:32.6c,Nagpur:32.0c,, New Delhi (S'Jung):32.0c,Jaipur:31.8c, Aurangabad (Maharashtra) 31.7c. Mahableshwar hotter than Mumbai today !! Today's Mumbai day temps:Colaba:34.9c, S'cruz:35.5c. Monsoon forecast: I think tthe Cyclone is moving as per the expectations in my blog written yesterday. Striking the coast near the A.P./Orissa border, and then sort of grazing it, and moving North-East. What happens to the Monsoon? 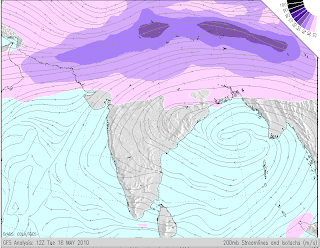 My personal assumptions are:The energy gets sucked into the system, and suddenly we find a drop in the rain rate around the Andaman Islands.This will stall the further movement of the Bay branch, by 4/5 days. A lot of rain will move up the east coast during the next 4/5 days. Can this be called Monsoon rains? Technically no. And,subsequently, as the Bay waters will cool down a bit, fresh momentum required for the monsoon may take another week.Monsoon will advance into North-eastern region in the first week of June. 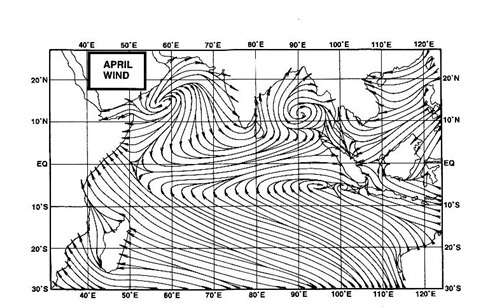 The Arabian Sea branch gets the initial pull from the cyclone,at the time the cyclone enters the land.Subsequently, the south-west flow of clouds and moisture can continue into Kerala uninteruppted. Hence, it is very possible, that regular monsoon winds can enter Kerala by the 25th./26th. Further movement Northwards may then take another week to gather momentum. The 200 hpa winds are not yet regrouped. The cyclone may have delayed this important parameter a bit,though their is no direct co-relation between the jet streams and the cyclone. Monsoon movement into Karnataka and Northwards could be in the first week of June. A well written article on the "warmth" coming up in the U.K. and the Indian region heat wave.